*HOT* RESET! 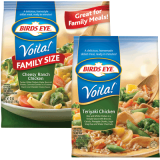 $3/1 Birds Eye Voila Product Coupon! Woohoo! Looks like this super high-value coupon has reset! Head over to the Birds Eye Facebook page to score a $3/1 coupon! These cost $3.98 at Walmart, so only $0.98 after coupon!